Over the weekend fashion brand illest announced that their latest collaboration would be with 2011 Formula Drift Champion Dai Yoshihara. The driver has teamed up with illest’s designers to create cross-branded apparel which includes shirts, accessories, and outerwear. You can check out some of the pieces in the pics below. Expect more Dai x illest apparel to drop in the near future. illest™ Announces Partnership with 2011 Formula DRIFT Champion, Dai Yoshihara for the 2012 Formula DRIFT Season. 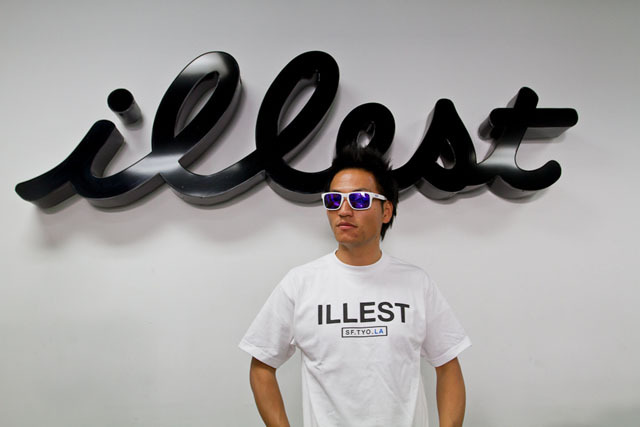 LOS ANGELES, CA (April 13, 2012) – illest™ Clothing, one of the most sought after lifestyle brands, continues its commitment to innovative collaborations through the partnership with reigning Formula DRIFT Champion Dai Yoshihara. illest and Yoshihara will unite to release a custom co-branded apparel and accessories line. The partnership brings together a leading lifestyle & fashion brand and an iconoclastic driver awarded “Best Style” in Formula DRIFT. The iconic illest logo will be featured on Yoshihara’s signature Nissan 240SX throughout the 2012 season as he defends his Formula DRIFT Championship title. Yoshihara, one of the only drivers to be sponsored by a leading fashion brand, will also represent illest on his custom racing suit and visor. “Fashion is very important to me, so opportunity to partner with a leading brand like illest is amazing,” said Yoshihara. “illest has a great sense of what Formula D is all about and the design process was a lot of fun for me. I can’t wait for everyone to check out the line”. illest has set the standard in fashion and cultural partnership, recently collaborating with G-Shock, Beats by Dre, Crooks & Castle, and DTA. The Dai Yoshihara line made its debut at Formula DRIFT Round 1: Streets of Long Beach on April 6-7, 2012. The apparel is available exclusively in the Fatlace Emporium. For more information visit: www.daiyoshihara.com and www.illest.com.